Each section consists of an introduction, which the authors call the "briefing." These introductions tend to give numbers and facts that document the problem. (Numerous footnotes seem to indicate that the numbers are at least colorably accurate.) These briefings probably do not tell the reader much that he or she did not already know, at least on some vague level. Though the scale of human trafficking might come as a shock, for example, the existence of the problem shouldn't. After the briefing are "field notes," first-hand accounts from a variety of sources. Some are from missionaries telling about their experiences among refugees, some from church leaders who have led their churches to reduce Christmas spending or to be more active givers to charity, and some are from people who have simply toned down their lives by eliminating what they do not need. Each section concludes with a "What Now?" section that asks the reader to reflect and then, perhaps, respond. This section contains a variety of references--websites, addresses, and so forth. This is a book aimed at Christians, filled with scriptural references. The focus is not on spreading the Word but on alleviating the injustices in the world, and to that end, the book is relatively free of specific doctrine and thus should appeal to all Christians, from the most evangelical to the most progressive or liberal. In other words, "Zealous Love" is not an attempt to proselytize. It is an attempt to get believers to respond to the greatest problems the world faces. There are a few minor objections I have to the book. The first is that it does not offer as many practical options as I expected. Perhaps it was simply that the words "A Practical Guide to Social Justice" at the top of the front cover led me to expect more. On the other hand, I hardly needed a book to tell me of all the charities at home and abroad for which we can volunteer or to which we can donate. Another small quibble is that the book itself is a rather heavy tome, printed on high-quality glossy paper. It seems to me that this product is not the most eco-friendly. These qualms are minor, though. For the most part, "Zealous Love" is a very good effort to call upon Christians to work for social justice, not by changing the world individually but by becoming more aware of the problems and working in some way to help alleviate the suffering of others. 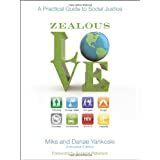 Want to learn more information about Zealous Love: A Practical Guide to Social Justice?